This function block can be used to create a vector out of a number of single elements. The maximum number of elements that can be merged into a vector in this way is 16. 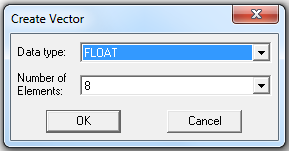 The parameter dialog can be used to select the data type and the number of elements. The function block changes its size according to the number of elements. If no connection exists, another data type can be assigned by creating a new connection at an input. The following example shows how to create a BIT vector out of a number of single values. This vector will be converted into a single WORD value and back into a BIT vector.